What a stupendous year in books! So many highlights: I finally read Jane Eyre, I was dazzled by David Mitchell and amused by Murikami, and James Michener took me on a 1,200-page historical trip to Hawaii (prior to an actual trip to Maui in May). In total, for the fourth consecutive year, I broke my previous record (61) for books read (67) in a year. Yep, it was a great year. Broken Monsters, by Lauren Beukes — I haven't been glued to the page of any novel in a very long time like I was to the last 100 or so of this one. It's a cool, creepy, contemporary tale of the broken American dream — and what happens to people when their dreams go to dark places. Shotgun Lovesongs, by Nickolas Butler — This story about friendship, secrets, music, celebrity, and loyalty takes place in a small town in Wisconsin. Several different characters narrate parts of this novel about mid-30s lifelong friends, and how their friendships have changed as they've gone out into the world, and then returned. It's just a fantastically profound and fun novel — and one that hit me just at the right time in my life to really love. The UnAmericans, by Molly Antopol — I stepped up my short story reading in 2014, and of the 10 collections I read, this was my favorite. These character-driven stories will are by turns devastating and enlightening – but they're all about imagining yourself in someone else's shoes. Wonderful. Station Eleven, by Emily St. John Mandel — I'm not a huge fan of the burgeoning post-apocalyptic novel genre, but this story is so much more than a traditional "what happens after everyone dies" story. Going back and forth to before and after the flu that kills much of the population, this intricate story is a masterwork of craft in how St. Mandel slowly reveals themes and each characters' back stories. It's a novel that slowly builds on itself for a whole that is so amazingly good. The Sleepwalker's Guide To Dancing, by Mira Jacob — Another story that jumps back and forth in time, I loved the protagonist of this story, and her attempt to deal with her slowly-going-insane-(or-is-he? )-Indian-immigrant father. An Untamed State, by Roxane Gay — Just a horrifying novel about a woman kidnapped, raped, and beaten in Haiti — and then she has to try to re-acclimate herself with "normal" life with her husband and son. I include this on my list for several reasons, but mostly the sheer bravery it must've taken to write this book. Fourth of July Creek, by Smith Henderson — A novel about our limits — both in terms of our "freedom" to deal with others' problems and of our ability to deal with tragedy. This novel has perhaps the most sobering and sad end-reveal of any novel I read this year. O, Democracy!, by Kathleen Rooney — I loved this small-press novel by Chicagoan Rooney about a staffer for the Senior Senator from Illinois during the 2008 election. It's, I guess, satire — but dammit if it doesn't feel real. The Martian, by Andy Weir — The most fun I had with a book this year, this novel about a stranded astronaut on Mars is part fiction about science, part goof-off novel, part testament to human ingenuity. Word is that Matt Damon is starring as Weir's astronaut in an adaptation of the novel, which in my mind, is an absolutely inspired piece of casting. The Bone Clocks, by David Mitchell — This is my favorite of the year. Mind-blowingly good. Mitchell is a genius. One of my favorite annual year-end articles is Slate’s “Overlooked Books” of the year. As is usually the case, this year’s list of 27 novels includes some terrific picks, such as Lauren Beukes’ Broken Monsters and Ben Marcus’ Leaving The Sea. But even the venerable Slate list can’t capture everything. So it’s always fun to supplement this list with one of my own. 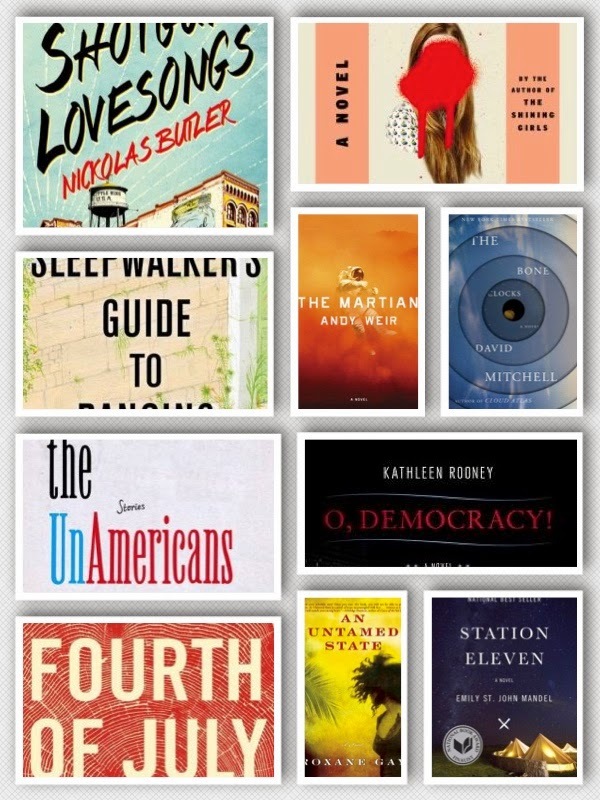 So here are five terrific 2014 novels you may have missed. If you don’t laugh about our broken political system, you’ll probably cry. This small-press novel about a young woman named Colleen who works as an aide to the Senior Senator from Illinois during the summer of 2008 will actually have you doing a lot of both. It’s a semi-autobiographical novel about Rooney’s own experiences, which is good to know, because at times it seems so absurd, it’s almost unbelievable. But then you remember how goofed up politics is these days, and so when you read about a candidate who tries get people to believe that dumping pollution into the lake is actually good for marine life, because they can eat it, you think, “yep, that actually seems about right.” If you have an interest in politics, or Chicago, you’ll really dig this novel. It’s debatable whether this debut novel is actually overlooked – this novel got a lot of looks due to word-of-mouth that spread quickly after its mid-summer release. But if you haven’t looked yet, I’d highly recommend you do. It’s a story about a social worker (a vastly under-represented profession in fiction) named Pete Snow in early 1980s Montana. Pete encounters a kid who appears to live in the woods with his anti-government, ultra-religious father, and so Pete has to decide how much he really can (or should, or be permitted to) help this kid. All the while, Pete’s dealing with his own disaster — his ex-wife (a drunk) has moved to Texas, and now his teenage daughter has run away. Henderson writes with pinpoint accuracy, making complex issues actually enjoyable to read about and consider. Purposefully set during the time Henderson seems to be saying is the dawn of the current culture wars, many of the issues are similar to those driving the national conversations these days. This is truly a great American novel. This is the best-titled novel of the year, in my view — so it’s a good thing the story itself, which took Jacob more than 10 years to write, is great, as well. Amina, late 20s, a freelance Seattle photographer, and the daughter of Indian immigrants, rushes to her parents’ home in Albuquerque to try to determine why her father, Thomas, is having day-long conversations with his dead mother. We zoom back to 1970s India to examine Thomas and his mother’s rocky relationship, and then to early 1980s Albuquerque to learn about Amina’s and her brother’s childhoods. You’ll think “Jhumpa Lahiri” right away because it’s an Indian immigrant story, but whereas Lahiri is mostly straightforward and earnest, Jacob is often playful, witty, and funny — even as she’s telling us about some rather weighty issues. It’s a strangely fluid story for as much as it jumps in time and place. This is easily the best short story collection I’ve read since George Saunders’ Tenth of December. It’s all killer, no filler — a rarity for story collections. But what makes these stories truly memorable are the characters in each — either foreigners (literally un-Americans), as in my favorite story “Minor Heroics,” about Jewish brothers in Israel, or immigrants to America who struggle for one reason or another, as in the heartbreaking stories “The Unknown Soldier” and “The Quietest Man.” In total, these stories are about imagining a world beyond our front door and identifying with and understanding people who live in that world — it’s an idea we’d all do well to take more to heart. If you read and enjoyed Meg Wolitzer’s The Interestings, you’ll love this novel of four mid-30s friends who grew up in Little Wing, a tiny town in rural Wisconsin. One has become a famous rock star. One is a Chicago business bonehead who convinces his new wife to move back to Little Wing. And two have gotten married to each other and stayed in Little Wing to tend the family farm. How these friends react to revealed secrets from the past, new problems with love and loss, and their new and different stations in life will affect their friendships now and into the future. This is just a massively great novel — one that seemed to just hit me at the right time of my life, and therefore has had a lasting effect. I cannot get it out of my head. Hopefully that’ll be the case for you, too. What would be on your list of underrated or overlooked novels of 2014? This novel is amazingly brilliant. And I loved it. Absolutely, intensely loved it. It's a great companion piece to Mitchell's most famous novel Cloud Atlas, but it's also a nod to Mitchell's other novels (characters from Black Swan Green and The Thousand Autumns of Jacob de Zoet pop up again), as well as ground-breaking films like The Matrix and Inception. In total, The Bone Clocks is just about the bravest, smartest, most entertaining, most inventive, and most fun to read novel I've put into my brain in a very long time. So the novel is actually six interconnected stories with one central character — Holly Sykes — as the anchor. She herself (in first person) tells us the first (in 1984, she's a 16-year-old girl running away from home in a small town in England) and the last (in 2043, as a 75-year-old living in the Irish countryside as the world collapses). The four stories in between, all as fascinating and entertaining as Holly's first-person story, expand on the overall narrative — which, and this is going to sound crazy, is about two factions of immortal beings whose souls can occupy human forms, but who are at war with each other, a classic good vs. evil story. The real genius of the novel is how Mitchell grounds this fantastical, metaphysical, centuries-long war in very human stories. And furthermore, it's amazing how Mitchell positions Holly at the center of all these stories, even when she's not overtly the protagonist. Stories Nos. 2-4, about a douchey college kid in the early 1990s, a war-zone journalist in 2004 Iraq, and an aging boozy English novelist (Martin Amis, perhaps?) traveling the world in the last half of the 2010s are all fascinating and terribly fun to read as set pieces. There's humor, there's tragedy, there are love stories, and there's treachery. But again the true genius of this novel is how details from each story begin to fulfill the promise of the clues Mitchell gives us in the first 100 pages (in Holly's first story) for what he's really up to. And then it's the fifth story where things get weird, and Mitchell brings it all together — and there's a battle, and a labyrinth, and a golden apple, and it's just so breathtakingly original and imaginative, you're in true, utter amazement. I was, anyway. It's one of those cases where you read a few pages, have to put the book down for a minute, go "wow," and then continue reading. This is my favorite novel of the year, and I need some time to decide yet, but it's not out of the realm of possibilities that it winds up as one of my favorites of all time. It'll be hard to tell, though, as it's clear Mitchell is sort of building an entire fictional world piece by piece with each of his novels, spinning off characters, reappearing characters, and furthering themes. I don't know of any writer working now or in the past as ambitious as Mitchell seems to be. I was on the edge before, but now I'm officially an incorrigible Mitchell fanboy. Man, this was good. And I'm jealous of you if you're going to soon pick it up for the first time. Station Eleven, by Emily St. John Mandel — Novels like this one that are so carefully constructed, so meticulously crafted, and so freakin' engrossing just absolutely astound me. How did she do this? How did she pull it all together? And how did she make it so much fun to read? All I know for sure is that she did, and this is one of the best novels of 2014. It'd be too easy to pigeonhole this novel as a post-apocalypse book — though, it is that. A band of survivors who call themselves the Traveling Symphony caravan around what had been Michigan 20 years after a deadly flu has wiped out 99 percent of Earth's population. They play music and perform Shakespeare, because, as one of our protagonists, Kirsten fervently believes, "Survival is insufficient." But the novel is also the pre-flu story of an actor named Arthur, his first wife Miranda, his friend Clark, and a guy named Jeevan who pops up in various roles throughout. So we jump back and forth in time to before the flu, to right after the flu, and then to 20 years after when the Traveling Symphony encounters a prophet — a religious fanatic who means them harm. Each piece of the puzzle falls into place, furthering both our understanding of these characters' connections to each other and also the themes of the novel as a whole — loyalty and friendship, the value and necessity of art, and, of course, the uncompromisable importance of empathy. I can't recommend this more highly — it's a book you won't soon forget. An Untamed State, by Roxane Gay — Unflinching. Devastating. Gay's debut novel is about a woman named Mireille who is kidnapped in Haiti. She is raped, beaten, and stripped of her humanity — indeed, she begins thinking of herself as "no one," both as a survival mechanism (she has to separate the person she is in captivity from from the woman she was prior to the kidnapping) and as a way to try to rationalize how these men, her tormenters, could be so cruel to another human. Eventually, when she's released, she and her husband must figure out how to be with each other after such an unspeakably horrible ordeal. It's not all smooth sailing. This is a book that, as much as you want to "look away," you can't. It doesn't exactly reinforce your faith in humanity, but it does reinforce your faith in a writer's ability to tell a horrific story with grace. I won't say this was a good time with a book, necessarily (indeed, it can even be insulting to men at times: "Girl children are not safe in the world where there are men," Gay writes) but it was one that was hard to put down. And I'm very glad I read it. Reading to try to understand something foreign isn't always easy, but it is essential. The Laughing Monsters, by Denis Johnson — You may know Denis Johnson from his highly acclaimed short story collection or his National Book Award-winning novel, Tree of Smoke. This short novel is a zany spy story about a guy named Roland Nair who is working, ostensibly, for NATO Intelligence — he's sent to Sierre Leone to find out what his former friend and long-time schemer, Michael Adriko, is up to. It's presumed the answer is "no good," and Nair soon finds out how right that is — but he has a few schemes up his sleeve as well. Will he join forces with Michael on one last get-rich-quick caper, or will he rat him out? This is just a good romp of a novel — you spend most of your time with it trying to figure out who will be loyal to whom, or who might be betrayed. Is there actually honor among thieves? And it's all set against the chaos and strange customs (to an American audience) of modern Africa, as the two (along with Michael's fiancee) travel from Sierre Leone to Uganda and then to Congo. This is a quick, one- or two-sitting read, and a good introduction to Johnson, if you've never read him before.